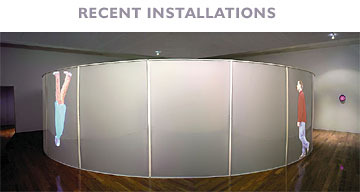 This section shows three 2005 installations from an extended year-long exhibit mounted at the Beecher Center of the Butler Institurte of American Art in Youngstown Ohio. Some small works done for a local arts organization. Photos of Hardesty preparing video for his pieces. And a 2007 extended 3-month exhibit at the Pittsburgh Cultural Trust's Wood Street Galleries.